There is only one thing that is more exciting than the new features in BuzzSumo, and that is applying them to your social media marketing efforts. In this post I will outline some new BuzzSumo features and share some practical ways you can use them. Just an intro for those of you who don’t know about BuzzSumo: it is a tool that allows you to identify top influencers and top content on a particular topic by social shares. This is super helpful for building prospect/outreach lists, identifying content that is shareable, and keeping an eye on the competition. You can see where you’re falling behind the competition and where there is blue ocean. BuzzSumo is a beautiful thing because it will support your case for stepping up the content game within your organization. Data that shows what is popular on social media will help you prove what it takes to compete. Okay, here we go! This feature is super cool because it allows you to see content that was most popular within a specific time period, by topic. This is great when you’re trying to identify seasonal content or to see what was popular during a particular event. Okay, how do I use that? Imagine you’re managing the content strategy for a website that competes for a share of voice in the conversation about healthcare in the US. If you’ve done your homework and read up on the industry, you know that the 2015 open enrollment period for The Affordable Care Act is coming up on October 1. With that in mind, you want to get an idea of what content might perform well during the open enrollment period by understanding what people were sharing during the last open enrollment period. You might use the query “healthcare OR obamacare OR affordable care act,” and set your date range for the 2014 open enrollment period, October 1, 2013-March 31, 2014. At a glance, there are a few themes among the content pieces that got traction. You can see that during the open enrollment period, people wanted unbiased information and to understand what Obamacare means to them. Of course they also wanted real lifehorror stories. Oh America, we all love us something to get mad about! It is no surprise that most of the content that got traction during that time was political, but the great thing about BuzzSumo is that it can help you identify the hidden gems, such as this article,which explains how advancements such as wearable technology and electronic prescriptions can actually decrease the cost of healthcare. If it were me, I would rise above the noise and start talking about some cool stuff like this. During hard and confusing times, America is always looking for a humorous outlet. Enter Jimmy Kimmel, who sent out a street team to ask American’s what they like better, Obamacare or the Affordable Care Act. Which do you think people chose? Hint, they are the same thing (durp!). You use the content alert feature the same way you would use Google Alerts, except these alerts are much more customizable! There are four different types of content alerts you can set up, including: Keyword/Brand, Author, Link and Domain. Alerts can get noisy but you have many options for organizing them. I like to use custom filters in Gmail (because i’m old school like that). BuzzSumo offers RSS feed options that integrate well with IFTTT, Feedly, etc. if you’re more into that kind of thing. BuzzSumo sent out this example of marketing trends in real-time created with the RSS function, as well. If you’re creating content about healthcare, you’re likely interested in the content that is being shared on that topic. Keyword/Brand Alerts allow you to monitor content that is getting traction in real time by keyword/query. You can set up advanced queries to ensure you are capturing as much content of interest as you can, and can also filter alerts by the amount of social shares the content is getting. So let’s say I am interested in content with the query “wearable technology AND health,” that gets over 50 shares. I can set up that alert. Same idea for brands. I can set up an alert for each time FitBit is mentioned in a post that gets over 10 shares. The domain alerts feature allows you to keep tabs on content pushed out by a particular website. In the screen shot below, you can see an example of a domain alert. I am telling BuzzSumo that every time Kaiser Health News pushes out an article, let me know. It gives me the option to set up minimum social shares, but its good to start with 0 and test the waters so you don’t miss anything good! You can always go back and edit the alert later. In a matter of 48 hours, I already have a plethora of great articles to get content ideas from. 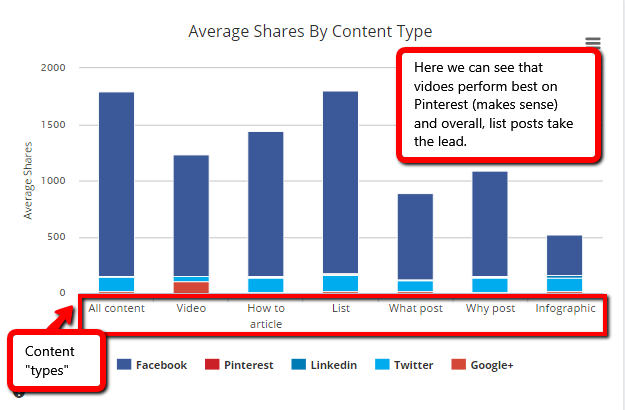 In the Email subject line, BuzzSumo will show you how many social shares the content has. You can also manage your alerts right in the BuzzSumo interface and filter by total shares or shares by social channel. Link alerts will come in handy when you are reporting, as Larry Kim mentioned in his post on SEL. If you launch a quality, shareable content piece and would like to report on links gained, you can set up link alerts. Essentially, this does the same thing as a tool like ahrefs, but BuzzSumo allows you to get alerts in real time. So you get pumped up to write about healthcare innovation, and you want to figure out who you can partner with or get ideas from. Author Alerts can help! You can use the influencer feature in BuzzSumo to find authors such as Dan Munro, a Forbes Contributor who writes on healthcare innovation. You can then set up an alert for a notification each time he writes an article. This is a fantastic way to find resources and to keep tabs on emerging trends and hot topics. As a content strategist, the more you know, the stronger your content will be. At this time, BuzzSumo offers two different types of reports, content analysis and domain comparisons. Reports are easy to download and so are the individual elements within them. They show 6 months of data. These reports are a goldmine as they allow you to see the following, by topic. You can also see top content and popular related topics. With this feature, you can see how you stand up to the competition. To show you how this works, I am going to take a top performing site on Twitter that is relevant to healthcare, Think Progress, and compare it to a top performing site on Facebook that is also relevant for healthcare, Conservative Tribune. The screen shot below is taken from the top of the report, which gives an executive overview of total shares and average shares. The export function is right there for you as well. Reflected in the data, you can actually see that Think Progress has a stronger Twitter presence than Conservative Tribune. Longer form content created by Think Progress and Conservative Tribune gets shared more across the board on Facebook, but that is not necessarily the case for Twitter. Notice how neither of these sites are getting traction on Google+? That might be something I would look into addressing in a social media plan. 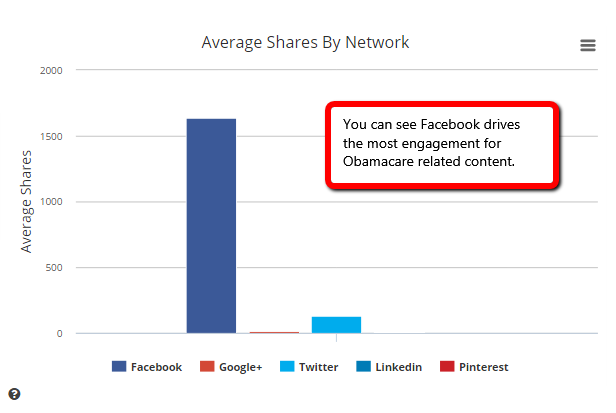 In order to get ideas for Obamacare related content that does well on Google+, I can go back and use my Top Content feature and sort by Google+. I can also go back to my content analysis report and see what competitors are doing well on Google+ to get a better understanding of what works. Whelp, there you have it, some new BuzzSumo features to enhance your social media marketing strategy. It is important to note that most features are limited or unavailable with the free version. There really is no secret sauce to content creation. Tools like BuzzSumo can give you brain food, but you’ve got to use it right. Do your research, spend time with communities and practice understanding humans and their intent. That will help you to create content that is compassionate, entertaining, and shareable enough to make a splash.